I havent made any TMNT customs in a few years, and most of the ones that I did back then got packed away in the garage when we moved here. anyway, I recently got some of the parts that I needed so I decided to try some new customs. I intend to do some more TMNT customs when I can get the time to work on them. all questions, comments, and criticisms are welcome. 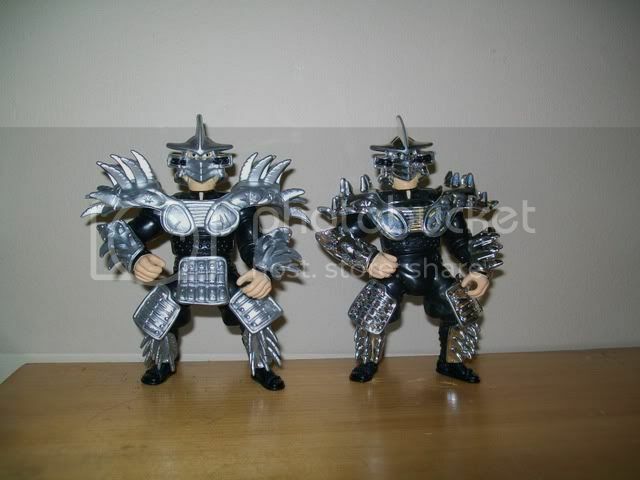 Prototype Shogun Shredder - initially Playmates intended to release Shogun Shredder using the armour from Super Shredder but done in chrome. however, as we all know that didn't happen. 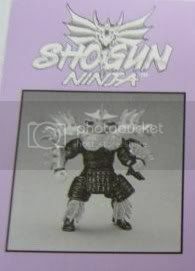 the only place I've ever seen the prototype Shogun Shredder was on the back of the package on the file card. (see below) and since Playmates didn't release it, I thought that id make my own. prototype from the file card. my custom with the original. as you can see it's pretty bulky, and the extra armour restricts the movement. at first I wasnt sure if I should have left certain parts of the armour unpainted like the prototype, but since all the armour on the regular Shoguns were painted, I decided that id do the same. the centre piece of armour came from a Norinaga, which was the original base for Shogun Shredder. the rest of the armour came from Super Shredder. 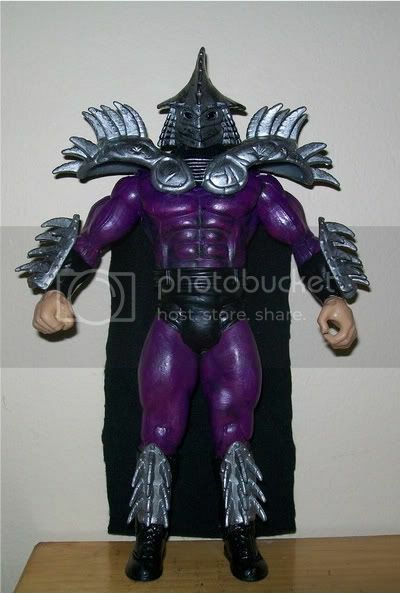 Devil Shredder - this version of Shredder was from the Japanese episodes. though technically speaking, he was only called Devil Shredder when he was in his demon form, not in his human form. I didn't know which paint scheme I was going to use cause I had 3 sources to choose from... his look based on the actual toy that was released, the show, and the production art. so I just used bits from all 3.
with the original Supermutants Shredder. 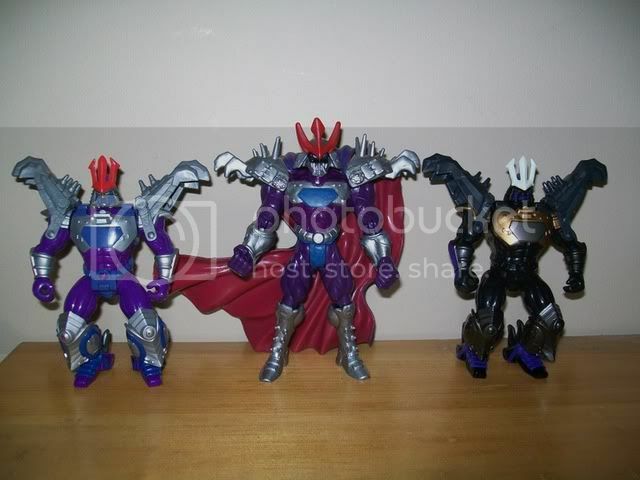 here he is with the original Devil Shredder and Dark Devil Shredder. Last edited by Sarah; 05-25-2009 at 06:01 PM. You have not one, but TWO Devil Shredders?! Nice customs. I prefer my capes to be cloth, but that cape is cool to. Your Shogun Shredder looks a lot better than the real one. Great job. WOW!!!!!!!!!!!!! Those are awesome. I especially like the devil shredder! Wow... you did two customs that I've always had in mind to do, and they came out great! These are beautiful, Sarah! I especially like the anime Shredder custom. Where did you get the cape? I think it's either a Spawn cape or a Total Justice Superman cape. Am I right Sarah? the shogun shredder looks pretty neat, definitely an improvement. actually, I have 3 of them. 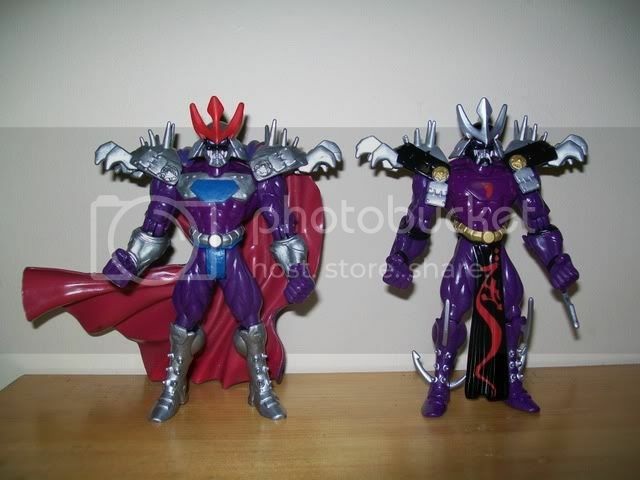 I've got a sealed Devil Shredder and Saint turtle, but I still need a sealed Dark Devil Shredder and loose Saint turtle. so if anyone has one for sale PM me. I couldnt have made them without the parts that I got from you. so I owe a special thanks to you. well when you get some loose ones Im definitely looking forward to how yours turn out. the cape is from a WildC.A.T.s Helspont. the best part is that it's already red and purple so I didn't have to paint it. and Wes, I just want to say that I love your site, and the review that you did on the TMNT anime. the cape is from a WildC.A.T.s Helspont. the best part is that it's already red and purple so I didn't have to paint it. Ooh, I hadn't even realized that it was red and purple! Any chance of any angled/behind the back photos to show that detail off? and Wes, I just want to say that I love your site, and the review that you did on the TMNT anime. Coming from someone who so perfectly rendered the anime Shredder in custom figure form, that means a lot! Excellent. 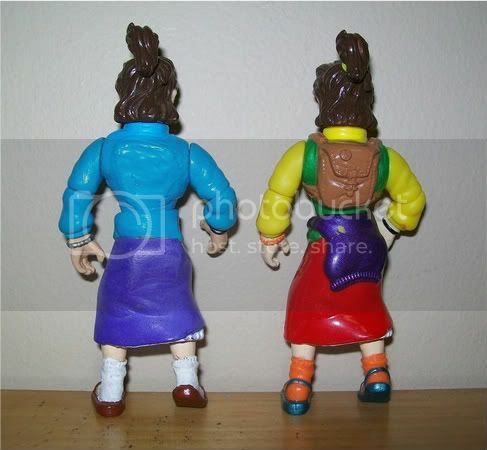 I had in mind to do a custom like that once I got a hold of an extra April figure. Although my plan is to use Ninja Newscaster's head instead. What did you use for the arms? That April is killer good. Yeah, what arms did you use? They look familiar. That's a great custom! I used a April II body and a regular April head. 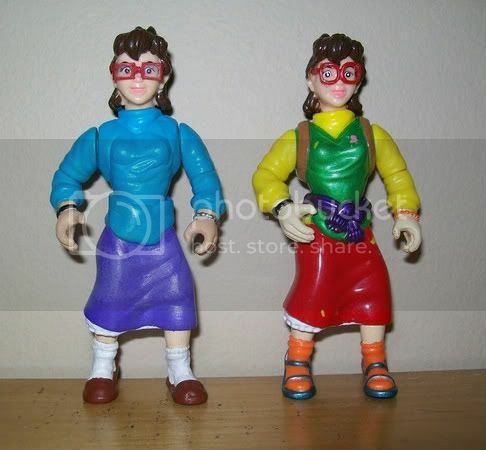 the arms are from a ST:TNG Troi. 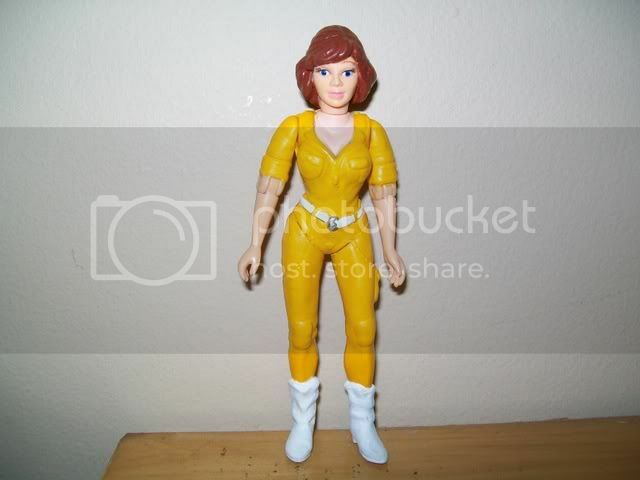 first I had to split the body of April II and remove the head and arms, then I sanded down the belt and added the parts from the other April and Troi. the worst thing about it was the yellow paint. it took a few coats to cover it and then all the layers hid some of the detail in the sculpt. 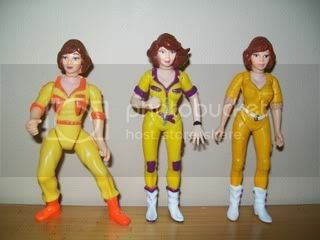 here she is with the other 2 April figs that I used to make it. Wowee! now that's an April! If playmates released an april looking like that I'd buy it ASAP! I have to agree and look all it took was a little bit of work, oh wait. Your customs are pretty darn amazing! I don't get alot of time to work on customs cause of my job, but when I heard about the custom contest I thought it would be fun to enter so I put aside some time for my entry. and since this is the first time Im doing a contest I took some pics to show how much I had to change the figure. 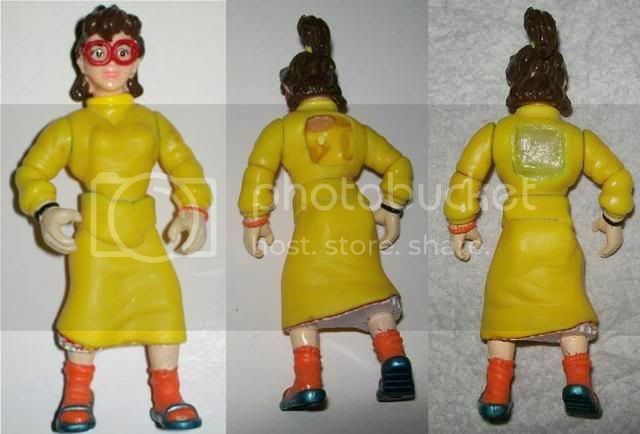 Irma - I always wondered what type of drugs the guys at playmates were doing when they came up with the design for the toon Irma. that thing was hideous to say the least. anyway, I wasnt pleased with it so I tried to make her look a little more like her appearance on the show. human Rocksteady and Bebop - Ive wanted to make these 2 for a while. they just didn't come out the way I thought they would. and for some reason Bebops skin tone is slightly darker in the pics. oh well, I guess they'll have to do. Super Shredder - while I was looking for my other Shredders I came across one of my old customs that I made about 5 years ago. sadly the paint is chipping and the cape is a bit worn from being packed away for so long. so I plan to retouch it and replace the cape with a plastic one. when I made this I didn't have any good pics to work from so I didn't notice until recently that he's actually supposed to have some extra blades on his shoulders, so I plan to add them. I don't know what to say.... I think they ALL came out great! I totally agree about the Irma figure. Now she looks as she should. 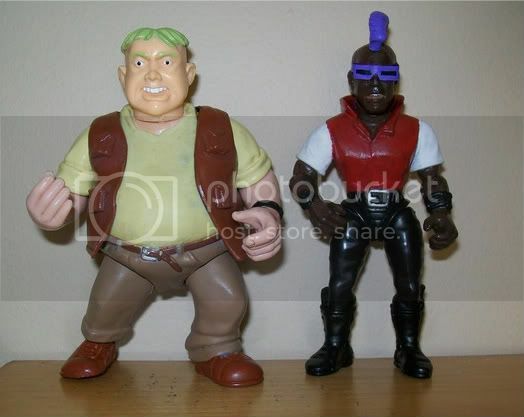 Bebop and Rocksteady also look wonderful. Your latest Shredder is looking really good also. How tall is he? I really like your custom of the Devil Shredder. All I can say is "Holy #%&@(*, I'm impressed"!